What can we expect from the iPad in 2017? As the calendar year quickly comes to a close, it’s time to begin taking a look at what’s ahead for technology in 2017. For the purpose of this blog post, we have taken a look at Apple’s iPad products and what features have been improved or rumored to be improved in the near future. This year we saw the introduction of the iPad Pro 9.7, which offered a more slim design, high screen quality and the best iPad camera to-date! So as we look forward to the New Year, we have put together an overview of all the rumors of the newest iPad set to be released in 2017. More options for iPad users? Rumors have it that there could be up to 3 new iPads released in 2017. Experts and analysts have been reporting that there will be three different sizes of iPads (9.7 inch, 10.9 inch, and a 12.9 inch). There has been no official confirmation from Apple on this claim, but speculation seems to be leaning to more options for iPad users. No more Home Button? Seems preposterous, right? 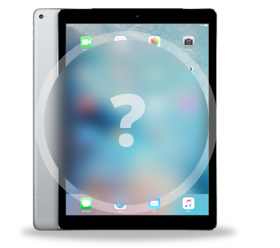 It is unsure whether or not this will be applicable to all of the upcoming models, but the rumor that has been circulating the brand new 10.9 inch iPad Pro will no longer include the home button staple that Apple users have become accustomed to using. So what is the solution? It seems as if Apple is going to adopt the Touch Screen home button that many smartphone have already been using. The hope is that this new feature will allow more screen space for iPad users. Furthermore, the rumor mill has it that most of the "border" on the iPad might be eliminated as well, all of this substantiates the desire for the screen to be larger on the newer versions of the iPad. Thicker Design? It seems interesting that Apple is, reportedly, already switching back to a thicker iPad after just previously switching to a thinner model. But, there is a pretty simple explanation: essentially, the newest models of iPad will be switching to a thinner bezel (glass screen) in order to compensate for a larger battery in the back of the device. According to sources, the new 10.9 inch version will about the same thickness of the original iPad Air (7.5 mm.). These are just some of the more corroborated rumors out there on the new iPad design. However, whether you are a current iPad owner or are considering purchasing one of these new iPad models; make sure to insure your iPad through Worth Ave. Group and avoid the risk of having to replace your iPad at a much higher cost! In fact, you can purchase insurance coverage for as low as $2.17/month which translates to just $26/year! Not only does our insurance cover all models of the iPad, but it also covers your iPad for a variety of losses, including: accidental damage, cracked screens, theft, liquid submersion and more!